June 2018, PCMEA (Pennsylvania Collegiate Music Educator’s Association), p.58. 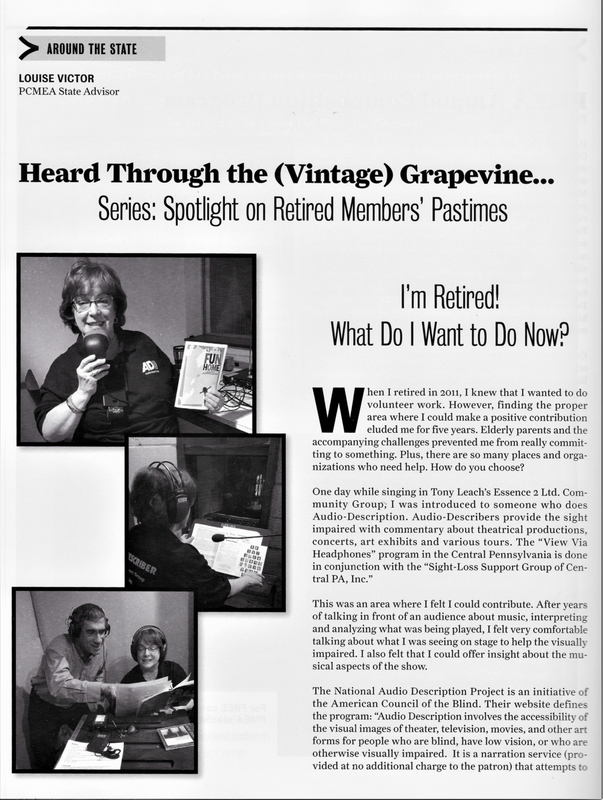 Around the State: Heard through the (Vintage) Grapevine...Series: Spotlight on Retired Members" Pastimes. An article by Louise Victor on becoming and audio-describer in her retirement. The Audio Describers and several members of the SLSG enjoyed a fun evening honoring Lisa McClain Wagner for her years of complete commitment to Audio Description, the blind and vision-impaired clients we serve, and all other Center for Performing Arts audience members with various disabilities. Thank you, Lisa! An excellent article by Heather Longley with detailed insight on the audio description experience. William R. Muzzy, President, Sight-Loss Support Group of Central PA, Inc., is included in the "Town and Gown's 12th annual edition of recognizing some of the outstanding men who continue to help this region grow and prosper." A full page article in the special advertisement section of the October 2014 Town and Gown explains the services of the SLSG. State College woman thankful for service dog eager to train another life-saver. An article by Casey McCracken about Katie Caplan training a black laborador puppy, Dewey, for the Susquehanna Service Dogs program. Susan Kennedy has been an audio describer for the Sight-Loss Support Group's View Via Headphones program, and audio description service that describes theatrical and dance performances for blind and visually impaired patrons. Jesse Smith, Board President, Sight-Loss Support Group of Central PA, Inc.
A self-employed structural engineer and leadership Centre County alumnus, Jesse joined the Sight-Loss Support Group board in 1997 when the organization needed help with strategic planning. Now celebrating its 30th anniversary, SLSG is experiencing growing need for its services as babyboomers reach the age when their vision naturally begins to deteriorate, he says. To meet that need, the organization's leadership is in the process of restructuring the services SLSG provides and the technology used to deliver them. By Kerry Royer, "Being born blind or losing your vision later in life can be frightening. But, as many in Centre County show, unable to see doesn't have to mean unable to try, unable to do, or unable to achieve." By Mike Dawson: "Since April, State College resident Josie Smith, 62, has served as the director of the SLSG. she is legally blind herself, and that is among the factors that motivate her in her job."